When it comes to work and jobs, we do not pay much heed to a lot of matters. And one of those matters is our negligent ways of work. We work tirelessly for the wages we get and in return, we expect our employer to at least provide us with a healthy work environment. Negligence is not only experienced by the employees from your employer. Even employees can be negligent towards the work they do. Negligence is a matter which cannot be ignored as the consequences can be bad. Negligence in work from an employee means losing a contract, a customer or even worst. A company can be sued for the negligent work they perform. Negligence can result in losing out on the repute that a company has developed over years. To avoid all these consequences, it is always better to train the employees to the standards of work and the expectations that a company has from its employees. Every industry has some ethics and codes of conduct and it a duty of every employee to follow them. Moreover, if an employee continues to be negligent in their work, a company can sue them and claim to pay any damages incurred by them. In a recent meeting with your line manager, it has come to our attention that you do not follow the code of conduct imposed by the company. 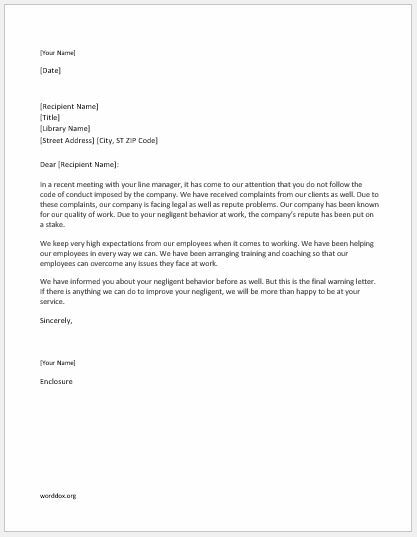 We have received complaints from our clients as well. Due to these complaints, our company is facing legal as well as repute problems. Our company has been known for our quality of work. Due to your negligent behavior at work, the company’s repute has been put on a stake. We keep very high expectations from our employees when it comes to working. We have been helping our employees in every way we can. We have been arranging training and coaching so that our employees can overcome any issues they face at work. We have informed you about your negligent behavior before as well. But this is the final warning letter. If there is anything we can do to improve your negligent, we will be more than happy to be at your service.